The new year opened with a bang and much reason to celebrate. The people of Tunisia are celebrating the first anniversary of the end of Ben Ali's rule. We are also celebrating the release of Egyptian blogger and activist Alaa Abdel Fattah, who was detained for 56 days for refusing to cooperate with the Egyptian military court. (We remain concerned, however, that he is still accused of multiple charges and will face trial in a civilian court.) 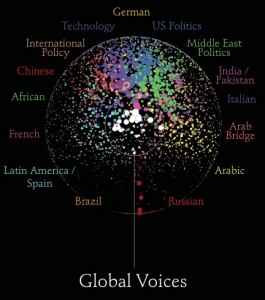 Global Voices also celebrated its seventh year in existence. 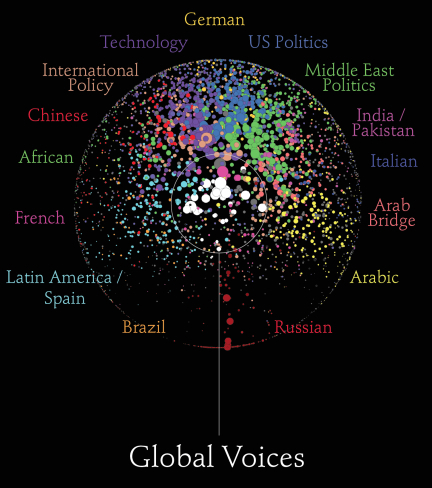 The image above shows how Global Voices is connected to citizen media conversations all over the world. Although the open Internet faces mounting challenges from all directions we are encouraged to see that netizens around the world are fighting back. “Hacktivist” groups continue to support cyber-activism around the world. For example, Telecomix hackers are helping Syrians detect and avoid government surveillance online, and there is also a project among the hackers to send a satellite into space in order to circumvent censorship. In the democratic West, the battle to preserve civil liberties and free expression online is centered around efforts to require censorship and surveillance in the name of protecting copyright. In the United States, netizens continue to oppose the Stop Online Piracy Act (SOPA), proposed by members of the House of Representatives. The PROTECT IP Act, (PIPA) the Senate's version of SOPA, will be brought to a vote on January 24. Internet companies are planning a blackout to protest against the bills and opponents are gearing up for a showdown. The digital rights advocacy group EFF provides a guide on how to meet the congress representatives in person to tell them one’s opposition against SOPA. Another website suggests other actions that opponents of SOPA and PIPA can take. Unfortunately, other governments are imitating the U.S. congress. The Spanish government has adopted its own SOPA-like law allowing copyright holders to get allegedly-infringing sites shut down within days of a complaint. Wikileaks cables released last year raise concerns that the US government pressured the Spanish government to pass the law. The Iranian government is moving ahead with its “Clean Internet” project: a national intranet to shield citizens from “immoral content.” According to a report from the Wall Street Journal, in recent weeks Iranian Internet users have experienced an Internet slowdown and blocked access to virtual private networks (VPNs). Iran also issued new regulations mandating Internet café owners to install surveillance equipment to monitor Internet users’ online activities and keep records of customers’ personal information. The Tibetan Autonomous Region government has passed a law requiring phone and Internet users to register with real names. According to the government, the new law can stop junk mail and prevent “harmful messages”. India’s anti-corruption website was suspended for showcasing content that allegedly mocked the Indian constitution. EFF has collected several cases of U.S. government efforts to censor twitter accounts, including a Boston district attorney’s subpoena of Occupy Boston Twitter account information. In Belarus a new law effective on January 6 requires not only Internet café owners, but also anyone who has shared Internet connections, to monitor their user. Owners of these Internet connections will be fined if they fail to report visits by their users to banned websites. Australian government documents released under that country's freedom of information laws confirm that environmental activists are being monitored by the Australian government. Documents also revealed that the Australian Resources and Energy Minister has secretly pushed for increased surveillance of activists protesting peacefully at coal-fired power stations and coal export facilities. RIM, Nokia and Apple have allegedly provided access for Indian intelligence to spy on user communications, in exchange for mobile presence in India. According to a study of 31 mobile operators in Europe, Morocco and Thailand, providers offer poor or weak defenses to protect consumers from illicit surveillance and identity theft. Outdated mobile network security protocols expose voice mail to hacking. Malaysian capital Kuala Lumpur issued an order asking all restaurants, cafes, and clubs larger than 120 square meters to provide wireless Internet access for free or at reasonable prices. Despite vehement criticisms (much of it from the United States) of ICANN's new generic top-level domain names (gTLD) program enabling new organizations to apply to run new top level domains (the part of the address after the “dot”, like .com or .net), ICANN has stuck to its plan to begin accepting new gTLD names applications this week. ICANN also said there is a possibility that the organization will issue a new edition of its Applicant Guidebook. For an excellent analysis of the arguments and controversies surrounding the new gTLDs, be sure to read this essay by Cyber law expert Susan Crawford. Chinese dissident Chen Wei was sentenced to 9 years on jail for his four online essays advocating political reforms. A New York Times opinion article by Vint Cerf, one of the creators of the Internet, asserted that Internet access is not a human right and that even though it is important, technology is an enabler, not a right. Cerf’s opinion has sparked debate and conversation. Tech companies are factoring stronger attention to Internet and human rights issues into their business decisions. Some companies like AnchorFree, are looking at this as a new strategic opportunity. According to the EFF, more and more companies have adopted a win-win strategy to support the initiatives on freedom of expression and also gain market advantages. International group of activists at the 28th Chaos Communications Congress created the Providers’ Commitment for Privacy (PCP) policy, a document outlining the best practices the writers believe Internet Service Providers should follow to respect privacy. The US government is increasing funding for cyber security programs and building strategy with an emphasis on Asian cybersecurity and space threats. Governments prepare for cyberwar as concerns about cybersecurity grow. Government engineers are building new viruses and worms that could neutralize an attack as well as planning to conduct denial-of-service attacks. Amnesty International’s UK site was hacked to serve malware in December 2011, and further evidence showed that that site was not the only target. Experts warned that other human rights organizations may also be compromised. A malware virus attacked 45,000 Facebook user accounts. Most of the accounts attacked were in France and the UK. China’s social media websites were reported to be hacked last December and users’ account information was leaked. The number of the users affected is estimated to be over 100 million. [NOTE: earlier this post incorrectly gave the figure of 1billion] The Chinese Software Developer Network first apologized for the leak of over 6 million accounts and PIN information, which was followed by an announcement from popular Internet forum Tianya Club which confirmed that 40 million users’ information had been breached. Chinese netizens reported that other major social media websites such as Sina, RenRen were also hacked. Major news media set up an organization to cope with the usage of their copyrighted articles: the organization will put code onto the online articles and track their spread. The organization claimed that only those who “scrape” the article will be targeted. People quoting and citing articles will be spared. Movie company Reliance Entertainment obtained an order from an Indian court to demand Indian ISPs block file-sharing websites. In Italy, the Court of Milan has held video sharing platforms liable for copyright infringement. Duke University explores what works you would be able to republish, remix, translate or make a play or movie from if the maximum copyright term was still 53 years (as it was according to the 1978 Copyright Act) instead of 70 years, as it is today. A study by the American Assembly found that 46 per cent of the over 2,000 people surveyed had engaged in piracy, with this figure increasing to seven in ten among people aged 19 to 27. The study also found that people prefer to use legal alternatives to view online content, but find the prices for content too high, which drives illegal file sharing. A Swedish student founded a religion called “Kopimism”, which has been recognized by the Sweden government. This religion makes it a creed that sharing and copying information is a virtue. Canada has expressed its interests in joining the Trans-Pacific partnership (TPP) negotiations. The impact of the TPP provisions on Canada’s copyright laws may be the extension of copyright terms, which is currently life of the author plus 50 years. If you are Canadian and support the idea of preservation of public domain, it’s time to take action! Bytes for All Pakistan has launched a new project called “Secure Journalists Programme” to evaluate the digital security of Pakistani journalists and bloggers. Internet expert Dan Berninger has initiated a program named “The 550 Challenges” to connect everyone on the earth to the Internet by Febrary 3, 2018, the 550th anniversary of Johannes Gutenberg's death. Cory Doctorow writes his take on Ethan Zuckerman’s “cute cat” theory of online dissent. Also be sure to see the talks by Cory Doctorow, Jacob Appelbaum, and Roger Dingledine at the 28th Chaos Communication Congress.